Imagine a full two hour Q & A show for the stage or parlour that involves no sleights, no gaffs, and no gimmicks. A two hour show that will be perceived by your audience as the real thing as opposed to a "magic trick"! This is Pure Q & A - questions are answered, futures are divined, telepathy is demonstrated, and the audience are enthralled. This is a manuscript that has been born out of true life performance - all ideas and scripts included are lifted directly from Paul's stage and parlour show. This is real world mentalism at its very best. Although the Pure Q & A show is designed for stage or parlour, there are many elements and ideas that can be transferred to a more close-up environment. Includes forewords by Luke Jermay and Neal Scryer. 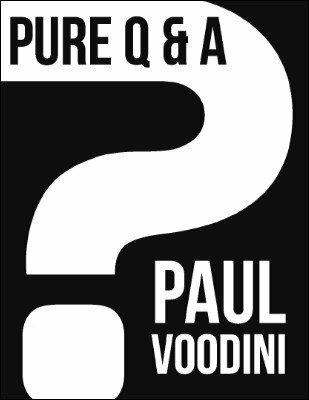 "Paul Voodini is my kind of mind reader, and his books are the kind of books I love to read. 'Pure Q&A' is no exception. I love this book, I love the material in this book, and I love what I know this book will do for you. I feel Paul’s thinking in 'Pure Q&A' launches him into the 'greats' instantly." - Luke Jermay. "I advise you to buy all of Paul Voodini's work on sight! Pure Q&A is Pure Gold! I cannot tell you how much I love this work!" - Neal Scryer. 1st edition 2011; 44 pages.